1 – Catch free music at the Notting Hill Arts Club – every Saturday between 4 and 8pm. 2 – Get on your own soapbox in Hyde Park’s Speaker’s Corner. 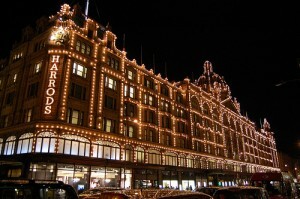 3 – Browse quail eggs, cava and custom-made cakes in the sumptuous food halls in Harrods. 7 – Cast eyes on a giant dinosaur skeleton in the Natural History Museum. 8 – Watch colourful street performers in Covent Garden. 9 – Walk to the top of Primrose Hill – survey London at your feet. 10 – Watch the Changing of the Guard at Buckingham Palace and Windsor Castle.